A small dining spot called The Feast had wonderful reviews, so we were a little surprised to find it located in a strip mall. There were a few outside tables, but we chose to eat inside as the open air view was of the parking lot. Local artwork on the walls was available for purchase and many of them were of local establishments on the water. The menu was quite extensive. 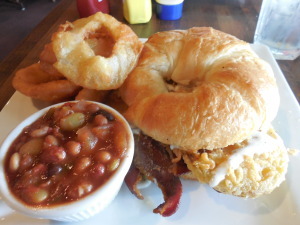 I decided on a Fried Green Tomato BLT on a croissant with onion rings and baked beans. It was marvelous! I love fried green tomatoes, but have never had them on a BLT before. The bacon was crisp and it had a sauce with a little kick. Having it all on a croissant was an added feature. The onion rings were crunchy and delicious, but I have to mention the baked beans. They were the tastiest I have ever eaten! They were several types of beans, almost like Creole beans, but whatever they did to them gave them such tempting flavor. I would return to The Feast for the beans, alone. Barb ordered a burger, fries, and coleslaw which she said were wonderful, too. True Nosh or Truly Nauseous? A true nosh. This entry was posted in Florida 2015 reviews, Noshes Up North and tagged Noshes Up North Review, The Feast on April 16, 2015 by MaryGrace. The owner of the house Barb and I rented on Anna Maria Island recommended the eating establishment Mr. Bones to us. 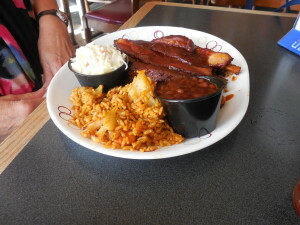 It is the spot that Phil said had the best barbeque in the United States. High praise indeed. We knew we had to try it. Walking into the restaurant our eyes immediately alighted on a coffin, which was filled with bottled beer. We made our choices and were guided into the small dining room. 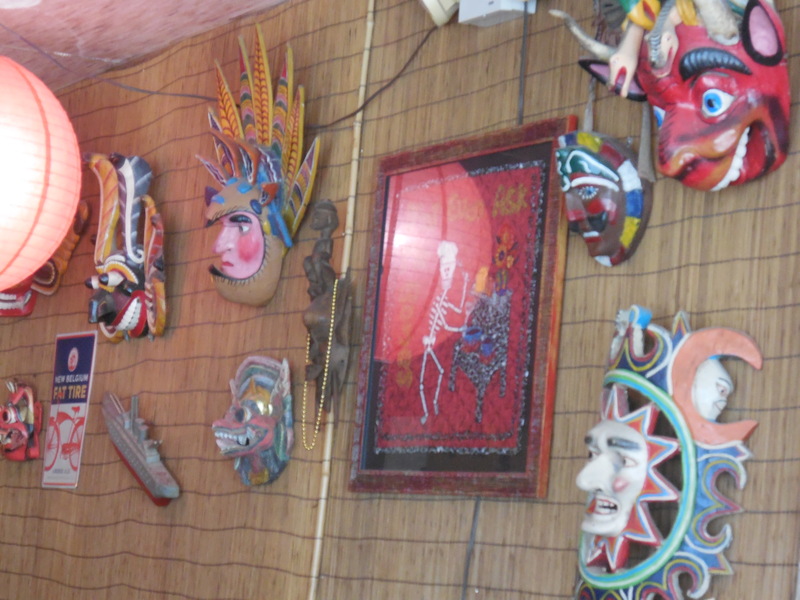 There were many masks on the walls that continued to give us a voodoo vibe. I enjoyed the atmosphere having never been in a place quite like it before. The menu had a lot more offerings than barbeque. After much deliberation, I made my selection. In this dining place, that is so well known for barbeque, I chose Chicken in Thai Peanut Sauce. 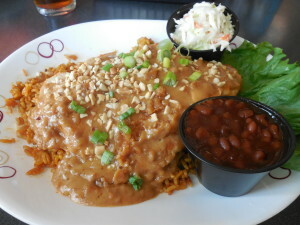 It boasted sliced tender breast smothered in a rich, spicy peanut sauce garnished with green onion and crushed peanuts. I also ordered curried rice with madras spices and vegetables which was served with mango chutney. The chicken was moist, but the sauce tasted like it was made with peanut butter. It was good, but I guess I was expecting more. The curried rice was flavorful and I would definitely order it again. Barb had the barbequed ribs and said it was excellent. Next time I need to remember to order the restaurant’s specialty. We each took a large portion of our meal home. 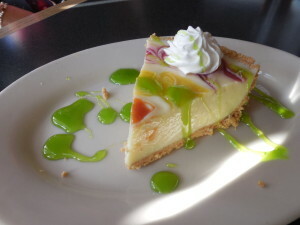 I did order Key Lime Pie for dessert, though. It was both beautiful and delicious! True Nosh or Truly Nauseous? Overall, a true nosh. This entry was posted in Florida 2015 reviews, Uncategorized and tagged Mr. Bones, Noshes Up North Review on April 15, 2015 by MaryGrace. While in Florida, Barb and I enjoyed a visit from another close friend, Kathy. Back in the day, the three of us taught seventh graders in rooms next to each other. It created a lasting bond. One night we chose to eat at The Beach House. We snagged a table right on the beach and basked in the warmth as day turned to evening. After some serious catching up (and a margarita) I decided to try two appetizers instead of an entrée. The first was Tots and Pearls. It consisted of Gourmet Tater Tots wrapped with house cured Norwegian Smoked Salmon, Sturgeon Caviar, and Crème Fraiche. Ordinarily I never would order tater tots, but I thought it sounded interesting. And it was. Beautifully presented, the small orbs of deliciousness, were sitting up invitingly. The firmness of the smoked salmon blended well with the slightly salty taste of the caviar. Velvety crème fraiche offered a contrasting texture as I bit into the smooth potato center. This tempting delight was certainly not my usual fare. The other appetizer I ordered was sliced Ahi tuna with pickled ginger and wasabi. This was wonderful as well. However, I knew I liked tuna, so it wasn’t a surprise like the Tots and Pearls. True Nosh or Truly Nauseous? Definitely a true nosh. 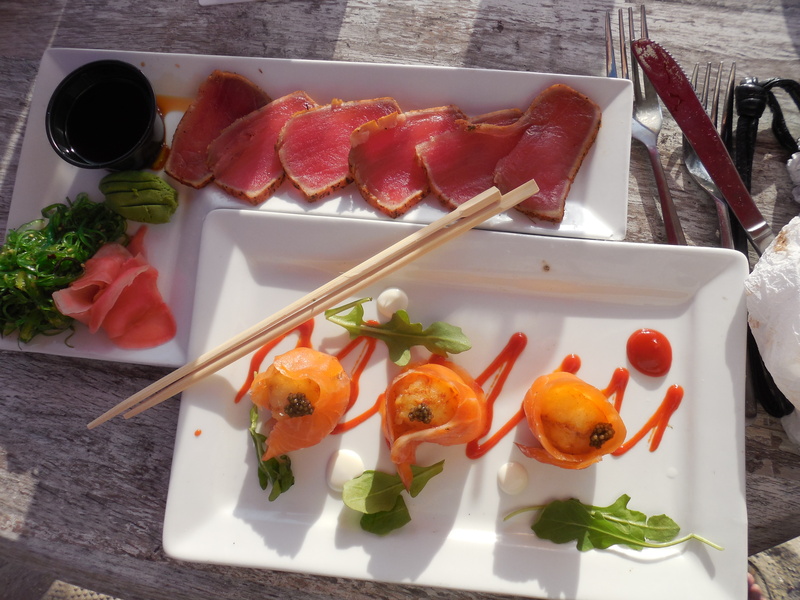 This entry was posted in Florida 2015 reviews, Uncategorized and tagged Noshes Up North Review, The Beach House on April 14, 2015 by Packerland.